Rim repair is a cost effective alternative to rim replacement. Factory rims can be costly- even on a basic model. 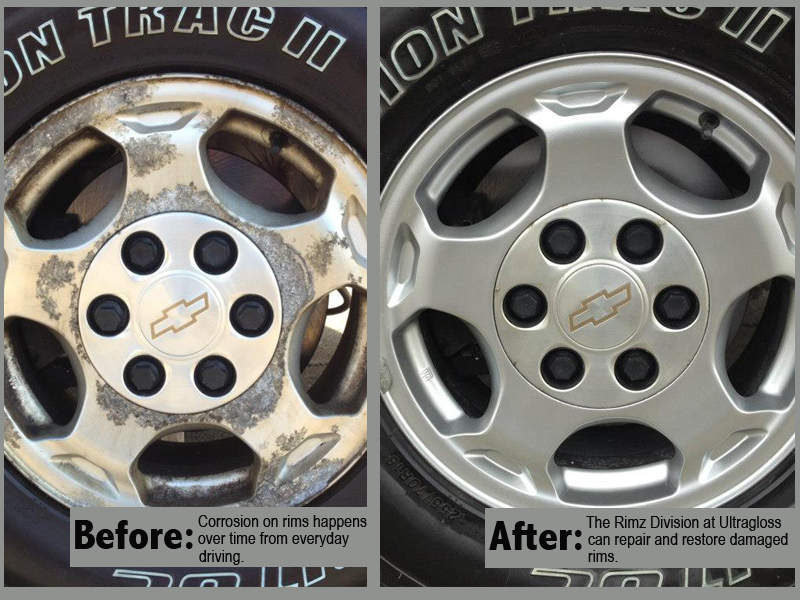 Our Rimz team specializes in repairing rims and hubcaps, ridding them of unsightly curb rash, scrapes, gouges and discoloration. Our specialized process is designed to last. The Rimz specialists at Ultragloss have developed a technique to properly restore your rims. It’s not a “quick fix”, it is a lasting repair backed by the trusted Ultragloss warranty. Do you need our Rim Repair Service? Did you scrape your rim or hubcap on the curb? Perhaps everyday driving has caused scratches and chips to accumulate on the surface of your rims. While these damages are unsightly, most people deal with it because replacing them is just too expensive. Why not get them repaired for a fraction of the cost? Our rim repair service starts at just $65. The hubcap refinishing service starts at $30. Call your Automotive Appearance Specialist for details: 330-252-9011 or stop by the shop for a FREE estimate between 8am and 6pm Monday-Friday. Don’t have time to stop in? Upload a photo here. For more pictures of our rim repair and customization service, click here. Q. What do you do to my rims or hubcaps? We repair, refinish, repolish, paint and fix almost any damaged wheel. We have a staff with over 20 years in the industry to help repair your wheels back to almost new condition. Can you fix chrome rims? Because of the complexity of the process and time involved, we do not currently fix chrome rims. We specialize in all types of non-chrome rims and can repair almost any non-structural damage. How do I know if my rims are structurally sound? Once our team arrives, the first step is to check the integrity of the rim. We will tell you whether it is in your best interest to purchase a new rim or send the old one out for a structural repair. Your safety is our priority, we want to be sure your rims receive the right service by the right people. Do you provide bulk discounts or contracts for dealerships? Absolutely. We provide a range of contract services to all types of auto dealership looking to keep their inventory in top shape. The best part is that we will schedule trips as often as our dealership client needs to handle the entire lot on site. Click here for more information about our dealership services or call the shop for immediate assistance: 330-252-9011 and talk to Josh Chancey.